I can’t get enough ginger this season. I bought a pack of candied ginger at Trader Joe’s for a recipe and practically finished the whole pack before I even got cooking. This easy cranberry martini with ginger is a perfect big-batch cocktail for a holiday party, and even more perfect after dinner with dessert. The secret is that these are actually very easy to make as far as cocktails go, but are definitely a spicier version of a holiday staple. Step 1: Cut the lime into a few wedges and rub one of them on the rim of the glass. Then dip the glass rim in the sugar. Step 2: Place some ice in a martini shaker. Add the vodka and cranberry juice, and shake well. Distribute evenly between two glasses. Place ½ teaspoon grated ginger into each glass. 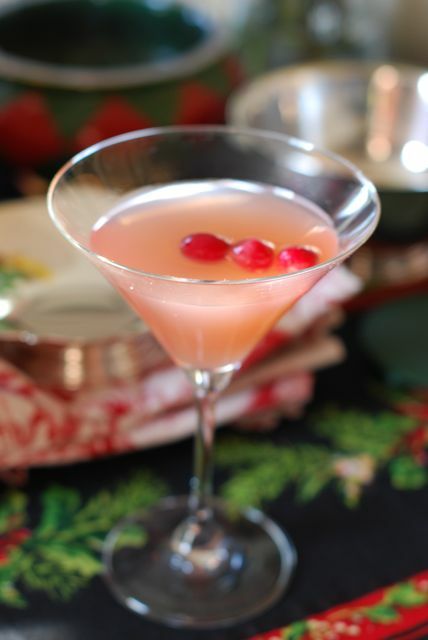 Drop in a few cranberries and enjoy.